Gerwyn Price battled back from 5-1 and 6-3 down to earn a point in week one against Peter Wright. Price was thankful, however, that Wright missed four darts at doubles to win the game. The match against Wright really was a game of two halves for Price in terms of double hitting; in the first six legs of the match he hit only hit one of his ten attempts at doubles, compared to the last six legs of the match where he hit five of his seven double attempts. Gerwyn Price reached the last 16 and the last 32 in the two UK Open qualifying tournaments that he participated in last weekend. He suffered defeats in last leg deciders against Peter Wright and Alan Norris respectively. Gary Anderson let a 5-1 lead slip against Michael Smith in week one, eventually losing 7-5 to his protégé. Anderson missed 14 darts at doubles to claim at least a draw from the contest. Anderson’s match average against Smith was a very lowly 82.46 – the lowest average of the opening week. His finishing percentage was only 19.2% which was also the lowest recorded by any player on the night. Much of his below par performance can be contributed to his ongoing back complaint that has been troubling him since November. He opted to miss the three UK Open qualifying tournaments played over last weekend and how fit he is remains to be seen. 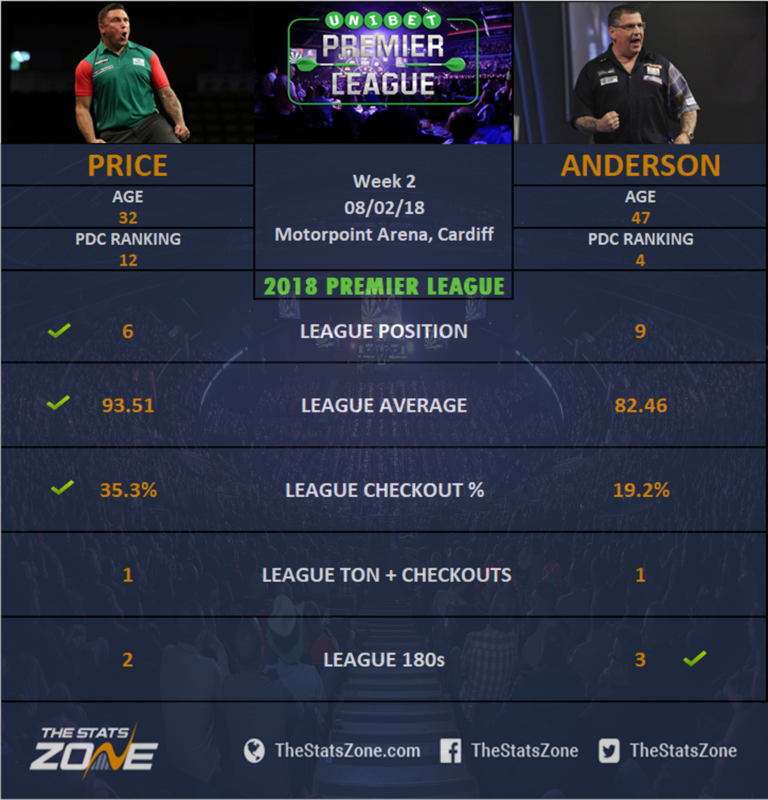 There should be plenty of tension and edge on the oche for this match, as there is no love lost between Price and Anderson as was highlighted in their recent encounter at the Masters. That contest went the way of Anderson, who afterwards said "If you can’t beat a man with a bad back, you better go back to the practice board". Welshman Price should enjoy plenty of vocal support from the big crowd and if he starts hitting the big scores his celebrations will really get under the skin of his opponent. The question mark again is over Anderson’s back and how near to 100% he will be; a fully fit Anderson would win this match but it’s difficult to predict with any confidence how his back will hold up during the match.